How much does it cost to travel to Monaco? How much money will you need in Monaco? €168 ($189) is the average daily price for traveling in Monaco. The average price of food for one day is €47 ($53). The average price of a hotel for a couple is €195 ($219). Additional pricing is in the table below. These average travel prices have been collected from other travelers to help you plan your own travel budget. How much money do I need for Monaco? Monaco is a small city-state that is completely surrounded by France. The Italian Riviera is only a few kilometers to the east and the country enjoys a wonderful, Mediterranean climate. Monaco is also the second smallest independent state in the world, with the Vatican being the smallest. It is six times as large of the Vatican and also the world's most densely populated independent country. It is entirely urban and a fun place to spend a few days. Monaco is divided into four areas. The old city is known as Monaco-Ville, Condamine is the port quarter, Monte-Carlo is a government district, and Fontvieille is known for its recreation and industry. Monaco is lacking in natural resources, but the climate and location make it a wonderful place to visit. Many businesses use it as a tax haven, while tourists take advantage of its resort-like atmosphere. 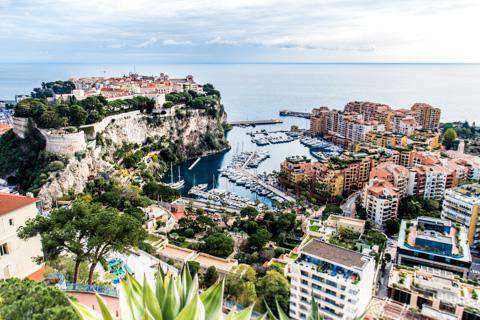 The easiest and most enjoyable way to explore Monaco is on foot. There are some significant elevation changes, particularly around the Exotic Gardens, so these areas may involve more strenuous hiking. Some of the steeper slopes in the city are also served by free, public escalators and elevators. A pedestrian-only ferry also runs to Port Hercule and can be taken for just one Euro. If you have the money to spend, a fun activity is gambling at the Grand Casino, which is frequented by many of the world's rich and famous. A passport is required to enter and there is a wide range of entry fees depending on the room you wish to enter. Cheaper rooms start around thirty Euros and more expensive rooms can easily reach several hundred. For a smaller entry fee you can visit the casino without gambling. It is worth visiting if only to see the spectacular gaming rooms which have stained glass, paintings, and impressive sculptures. It is also important to realize that there is a very strictly enforced dress code. Men must wear coats and ties with no "casual" shoes. Monaco plays host to one of Europe's premier social events every year; the Formula 1 Grand Prix. It is organized by the Automobile Club of Monaco and takes competitors through 78 laps of Monte Carlo's narrow and twisting streets. The close proximity with which spectators can view the race is one of the main attractions. 3,000 seats are sold each year and Monaco residents will rent out their terracees for the event for large sums of money. If you're in town during the off season you can grab a map of the route from a tourist office and walk the course. Monaco is not a place to shop if you're on a budget. There are plenty of high end shops throughout the country though if you have money to spend. Chic clothes shops are found in the Golden Circle which is enclosed by Avenue Monte Carlo, Avenue des Beaux-Arts and Allees Lumieres. Here you will find Hermes, Christian Dior, Gucci and Prada. If you're looking for jewelry, head to the area near Place du Casino where Bulgari, Cartier and Chopard are located. If you aren't up for spending the money, it's still fun to window shop, which is a common activity among tourists. Shopping hours are from 9 am to 12 pm and 3 pm to 7 pm. Staying in Monaco is quite expensive. If you're on a tight budget you'll do better to head out of town and stay an hour or so away. Nice is only half an hour away and Ventimiglia is another more affordable seaside town near the French-Italian border on the Italy side. Monaco-Ville: This picturesque area is known as "the rock." It's a medieval village that is still made up almost exclusively of pedestrian streets and passageways. Many of the houses are historical, but there are also a good number of hotels, restaurants and souvenir shops that appeal to tourists. Sights within the area include the Prince's Palace, the Cathedral, the Oceanographic Museum, the City Hall, and the Saint Martin Gardens. Palais Princier (the Prince's Palace): Located in Monaco-Ville, this palace is well worth a visit. There's a panoramic view that looks out on the Port and Monte-Carlo and a changing of the guard cermony takes place every day just before noon. There are also daily tours of the palace that run throughout the day. Monaco Cathedral: Built in 1875 on the site of a 13th century church, this Cathedral is dedicated to Saint Nicolas. It houses the remains of former Princes of Monaco as well as Princess Grace. Dining out in Monaco is delicious but expensive. Some favorite restaurants include those found on the waterfront along the Port de Fontvieille or around the Casino. Eating out during the winter months may be slightly more affordable. If you are on a tight budget there are some small cafes throughout the city that serve simple meals such as pizza or hot dogs. Barbagiuan: This is a sweet pastry appetizer that originated in Monaco but is served throughout the region. In Monaco, they are most often available on National Day. The pastries are filled with rice, cheese, leeks and either pumpkin or spinach. Fougasse: Also a sweet pastry, this option is made with orange-infused dough that is topped with nuts and anise seeds. Stocafi: A national dish of Monaco, this is made with dried cod that is stewed in tomato sauce. It is flavored with black olives and small vegetables.